I saw the premiere of Total Divas where I learned a valuable lesson: women can get very catty. Total Divas features the lives of several WWE Divas, especially the Bellas, Funkadactyls, and Natalya, while kicking kayfabe to the curb displaying (mostly) their real names and relationships. One narrative stands out: two “newbies'” quest for respect and fame in the WWE. Newcomers Jo Jo and Eva Marie have arrived. Not much is shown about Jo Jo, but Eva Marie makes a decision that could color her wrestling career. WWE VP of Talent Relation Jane Geddes gave Eva the directive to dye her hair blonde. She only later gives the reason, effectively “that’s the bottom line, because (w)we say so.” That never sits well with Eva Marie. 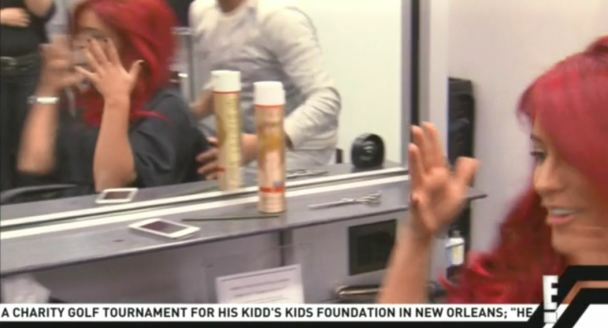 At the hair salon, she decides to go the full flaming red hair dye job. The VP smiles it off but warns Eva Marie not to do it again because WWE knows best. There are two sides. Obviously, Ms. Geddes has authority and is going to assert it. It’s probably hard-wired in many of us that it’s essential to obey the boss’ orders to stay employed. From such a point of view, it’s easy to see that Eva Marie is being an insubordinatin’ noob. On the other hand, the WWE is a company that makes individuality a commodity. I can’t think of a success story where WWE micro-managed someone all the way to the top. The moment Ms. Geddes saw Eva Marie’s hesitation about being a blonde, they could’ve talked things over. The VP of Talent Relations didn’t give a very persuasive reason for Eva to do the (dye) job. Focus groups, the “WWE Universe” reacts better to blonde-haired women, they altered her hair color in some image manipulation gizmo and they liked what they saw, et cetera. I don’t see how Eva Marie could’ve been unmarketable without the golden hair. Does that mean that Eva Marie is my favorite newbie Diva and I want her to become a biggest deal ever? I’m not a fan yet, but the flaming red hair she sports works for her. If Eva Marie’s not whining and complaining while pays her dues then she’ll be interesting to watch as a member of the main roster. Will a hardline approach make Jane Geddes an effective WWE executive? Has Eva Marie ended her chance at wrestling stardom before she has even begun? Will poor Nattie Neidhart get some respect as the preeminent blonde Diva? Don’t look to me for answers. Total Divas isn’t must see TV worthy of high emotional investment. I might watch here or there, but there’s only so much reality-TV drama I can take. Eva Marie’s official Twitter page.